Traditional SEO relies heavily on producing original, organic content and maintaining your website in the same manner as a well-serviced vehicle. Effective execution of on-page and off-page SEO contributes to industry thought leadership and drives organic search traffic with the ultimate goal of converting users into leads and customers. Local SEO and a standard SEO campaign are not mutually exclusive. Rather, local SEO is a powerful tool that B2B, B2C, and local and national companies should use in conjunction with traditional SEO to maximize brand awareness, engagement, and consistency across the web. In decades past, one would have to flip through the Yellow Pages or an industry-specific publication to find business information. Naturally, citations have moved into the digital realm, with Google My Business, Facebook, and Yelp leading the way. The concept of having accurate, up-to-date business listings in print publications applies just as much, if not more, to online citations. More often than not, a citation will be the first interaction a user has with your brand. Inconsistent citations and a poor setup of listings tend to drive users away, making them less likely to click through to your website to engage with your brand. A well-constructed citation should have the look and feel of a high-quality visual advertisement with intriguing ad copy. In addition to guiding users to a physical business location, each citation acts as a backlink to your website. Inconsistency in NAP (Name, Address, Phone Number) across multiple citations will not only confuse users who attempt to call or visit a physical location; it also hurts the image of your brand as reliable and professional. Well-constructed citations result in an increased click-through rate, which in turn provides a greater chance for converting users into leads or customers. More importantly, citation backlinks contribute to increased domain authority of your website, which directly affects your site’s ability to rank for high-competition, high-difficulty keywords. Take advantage of Farotech’s local SEO reporting tool below to assess the consistency of your business’s citation presence across the web. The report is automatically generated and immediately available for download, free of charge. Farotech’s Local SEO Dashboard allows you to monitor, edit, and update 50 of the web’s top citations with one click of a button. Our Local SEO & Review Management package includes the setup of a customized, branded dashboard with a personal login. Farotech will verify all relevant information, including NAP, photographs, logo, etc., during the setup of your account. Once activated, 50 citations are immediately synced with the information provided. In addition to seamlessly syncing data, your personalized dashboard allows you to remove any duplicate citations and inconsistencies. If there are high-value directories associated with your industry that fall outside of the top 50, these can be added and synced as well. How likely are you to eat at a restaurant with a 1-star review on Google? Would you visit a dentist or doctor with a 2-star rating and fiercely negative written reviews? 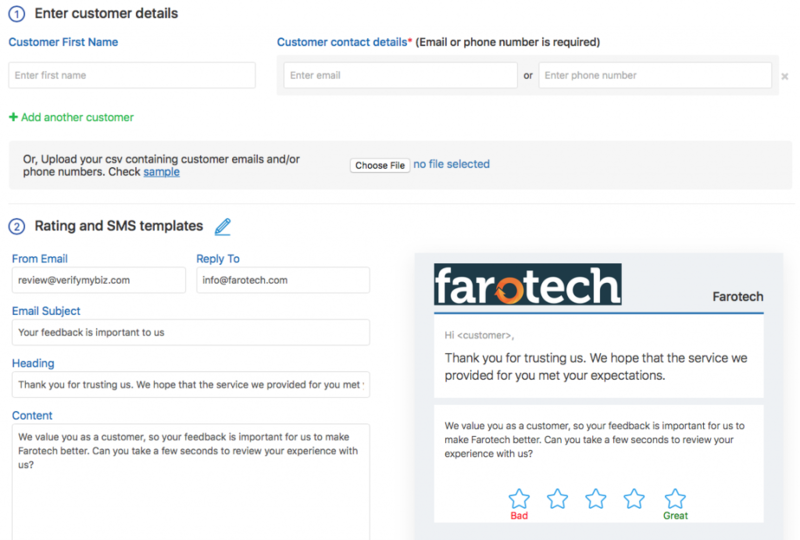 At Farotech, we know that one angry customer or patient can drastically skew a prized 5-star rating, especially if your business has a low quantity of ratings. Business as usual is a standard expectation from consumers who are unlikely to leave a review unless otherwise prompted. Individuals are more inclined to leave negative reviews due to their heightened emotional state following a bad experience. How, then, do you garner a large number of positive reviews and deal with the negative ratings and comments that are available for all to see? Many businesses will verbally ask consumers to leave a review upon receiving the service or product. This requires the individual to make a mental note for later, find your business online, and take the time to complete a review. It’s a shot in the dark with no real data to show effectiveness. 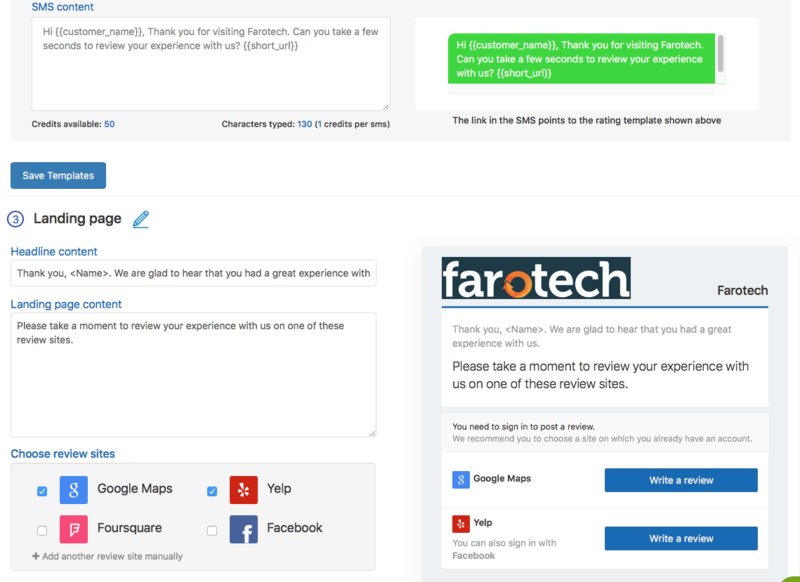 Farotech’s custom Local SEO & Reputation Management software allows you, the business owner, to input the email addresses and phone numbers of current and past consumers, who will then be sent a request to review your business on the site(s) of your choosing. Your customers will receive these requests on their phones or computers with direct links to review your business. Using this technique, it is possible to increase the number of ratings and reviews that drown out the negative responses, therefore preventing one or two disgruntled people from skewing the numbers. Industry-specific review sites that are not listed within the dashboard can be quickly added to the review generation emails and text messages. The review generation technique mentioned above is the most effective method of managing ratings or stars, but what about written reviews? As a business owner in the internet age, it is vital to stay engaged with your audience. Written reviews are openly available for all prospective customers to read; anyone can judge the quality of your services or products based on these reviews. Responding actively to both positive and negative reviews is the best way to show you are listening to your audience. When responding to negative reviews, it is important to keep the replies to a minimum. Do NOT engage in an argument on a public forum. Tell the user you are listening, thank them for their feedback, and ask them to contact you privately to work out the issue. If they reply with vitriol, end the conversation there. Thank customers for positive reviews and feel free to engage them in further conversation about their experience, even offering small ‘thank you’ incentives for their review. This will encourage other passive customers to leave reviews of their own. Farotech’s Local SEO Software centralizes all of the major written review platforms into one dashboard, allowing you to view and respond to them in real time. 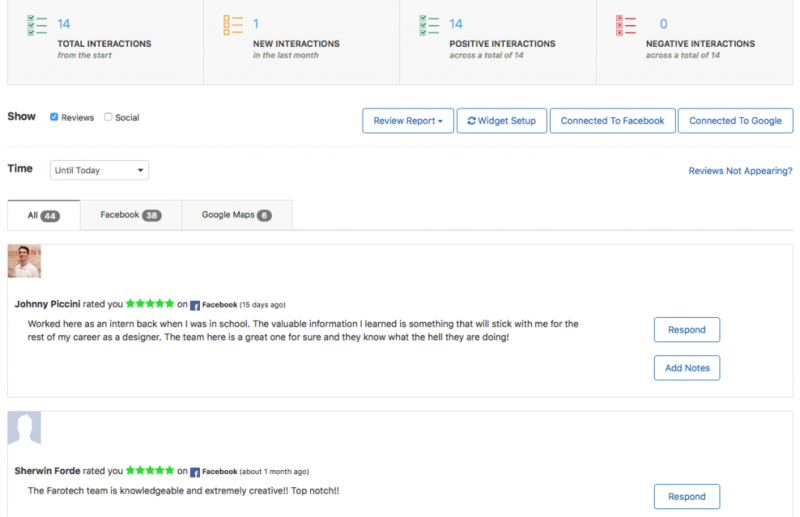 Instead of logging into Yelp, Google, and Facebook individually and responding to reviews within each platform, our software aggregates all of them into a simple dashboard that will turn hours of replying into minutes. To reap the numerous benefits of our Local SEO Dashboard & Reputation Management, contact our office today.